Happy Hanukkah to all my Jewish Friends! My friend, Buddah has created 6 unique collectible jars of Cherry Jalapeno preserves. 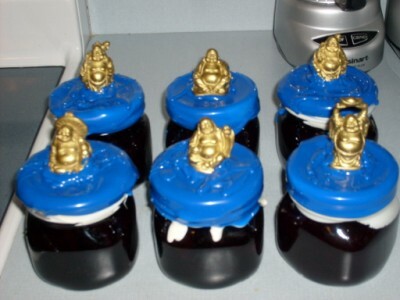 Each jar is sealed in wax and topped with a Happy Buddha figure. Here’s a link to all six auctions on ebay. Buddah’s preserves look great!!! And for a good cause. Thanks for the compliments and thanks to all my bidders. The auctions are in their final 24 hours, so if you want in please get in before it is too late! I will be including a small surprise along with the collectible and 8 oz sample of preserves.